Mitochondrial dysfunction is recognised as a key factor of aging. 50% more mitochondrial damage is found in the brains of 70 year old's than in the brains of middle-aged people. Mitochondrial dysfunction is now conclusively linked to most all age related killer diseases including Alzheimer’s, type 2 diabetes and heart failure. Many studies document the therapeutic benefits of CoQ10 in relation to these degenerative disorders. It is a micronutrient that boosts mitochondrial health and increases energy production in the body. The greatest, most recent development in this field is the coenzyme pyrroloquinoline quinone (PQQ). This has a vital role in many biological functions. As with CoQ10, it is also a micronutrient. It displays powerful antioxidant actions that defends effectively against mitochondrial damage. However, in 2010 it was discovered that this micronutrient did not only act as a protection agent; it was found that it also prompted new mitochondrial growth. 10 mg of 99% pure PQQ Di-sodium salt with 100 mg 99% pure, fat soluble Ubiquinone CoQ10 and 200 mg of Long Pepper. The PQQ grows more mitochondria and increases their function. The CoQ10 accelerates the mitochondria, enabling them to produce even more power. It’s a synergistic combination for maximising physical and mental performance. Vitality Foundation combines PQQ with 99% pure ubiquinone – CoQ10. As a result, the beneficial CoQ10 enzyme remains in your blood stream much longer than CoQ10 alone. This new formula combines the mitochondria-building power of PQQ with the energy accelerating effect of CoQ10. This means a bigger energy boost than either PQQ or CoQ10 can deliver alone. 200mg of Long Pepper completes the formula. Researchers showed that piperine (one of the active ingredients of Long Pepper) may serve as a potential functional food to improve brain function. Peppers also aid in assimilation of nutrients in the gut. The CoQ10 does more than just increase energy production in your mitochondria, it protects existing mitochondria from aging. CoQ10 is a powerful antioxidant; eliminating mitochondria damaging free radicals. Protecting the brain, heart, and muscles against degenerative disease. The formation of new mitochondria in aging cells. Vitality Foundation is best taken with a fat/oil (such as butter, raw olive oil, coconut oil, raw hemp oil) or with eggs or raw nuts; for significantly improved absorption. This will match the absorption of the far more expensive Ubiquinol form of CoQ10. CoQ10 has been around a long time now, but it can only get you so far on it's own and for some people can be difficult for the body to absorb. Decreased energy occurrs as you age no matter how much CoQ10 you take because you're not producing enough cellular energy anymore as the mitochondria (the cell's "batteries") become dysfunctional and damaged. However, now there is a supplement that can regenerate and recharge your cellular energy. This combines CoQ10 and Long Pepper with an amazing molecule called PQQ that restarts energy production throughout your body by growing NEW mitochondria in every cell. Now one can enjoy renewed vitality and increased energy with this natural nutrient. As one ages, mitochondria become damaged and dysfunctional and youthful energy drains away. The ability of cells to generate energy declines. This causes fatigue. One will feel far less vigorous and have far less stamina than when younger. Thanks to the breakthrough discovery of this little-known bioactive compound called pyrroloquinoline quinone (PQQ for short) your DNA can now be prompted to replace old mitochondria which have lost their ability to generate energy. This is a process known as mitochondrial biogenesis (the growth of NEW mitochondria). There is a significant body of clinical research that proves PQQ's ability to grow new mitochondria and enhance the mitochondrial functions that generate cellular energy. In addition to stimulating the growth of new mitochondria, PQQ improves the function of the mitochondria one already has. One of the things that can harm mitochondria are dangerous free radicals. They are capable of destroying healthy cells through unchecked oxidation. A recent study concluded that PQQ is effective at protecting the mitochondria from oxidative damage. So it is also a powerful antioxidant. CoQ10 and PQQ can help one remain free of degenerative diseases like heart disease, Alzheimer's, Parkinson's, diabetes and more. It will help to keep the brain working well too! I was further drawn to this wonderful nutrient when an elderly friend of mine with many health issues started taking it. Amongst other issues he was suffering from low energy and was effectively debilitated. He was taking statins (a drug that blocks the effect of CoQ10 from helping the activity of mitochondria). He found that taking CoQ10 did improve his energy and ability to exercise (walking) but later when he added PQQ to his regimen he reported a real boost in well-being and energy. Basically the more mitochondria you have, the more power they produce for your body to run on. With aging, as much as 95% of mitochondria can become dysfunctional. Mitochondria produce energy by converting glucose and oxygen into carbon dioxide, water, and energy. This is respiration on a cellular level. The faster this respiration reaction takes place, the more energy mitochondria can produce. This is where CoQ10 fits in. CoQ10 can speed this reaction therefore increasing cellular energy production. Many people do not have the required success in taking CoQ10 alone, because it is trying to speed up the energy production process in a system that does not have the ability to produce that power in the first place (i.e. having a dearth of mitochondria). The benefits of CoQ10, including increased energy, improved metabolism, lower blood pressure, and reduced risk of cardiovascular illness and cancer are considerable and well-documented in medical literature, but to be effective CoQ10 also requires a good and plentiful level of mitochondria in the body. It is also well-documented that the body's CoQ10 levels decline as one ages. The PQQ grows more mitochondria and increases their function. The CoQ10 accelerates the mitochondria, enabling them to produce even more power. It's a synergistic combination for maximising physical and mental performance. 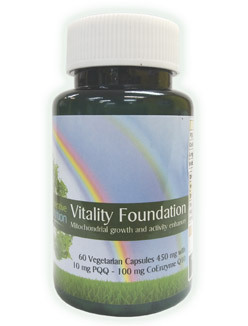 Vitality Foundation combines 10 mg of PQQ with 100 mg of 99% pure ubiquinone CoQ10. As a result, the beneficial CoQ10 enzyme remains in your blood stream much longer than CoQ10 alone. This new formula combines the mitochondria-building power of PQQ with the energy accelerating effect of CoQ10. This means a bigger energy boost than either PQQ or CoQ10 can deliver alone. The CoQ10 does more than just increase energy production in your mitochondria, it protects existing mitochondria from aging. CoQ10 is a powerful antioxidant; eliminating mitochondria damaging free radicals. 200mg of Long Pepper completes the formula. Researchers have shown that piperine (one of the active ingredients of Long Pepper) may serve as a potential functional food to improve brain function (as does PQQ). Peppers also aid in assimilation of nutrients in the gut. There is some discussion that the Ubiquinone form of CoQ10 is inferior to the Ubiquinol form, due to issues with absorption. Vitality Foundation is best taken with a fat/oil (such as butter, raw olive oil, coconut oil, raw hemp oil) or with eggs or raw nuts; for significantly improved absorption. This will match the absorption of the far more expensive Ubiquinol form of CoQ10.